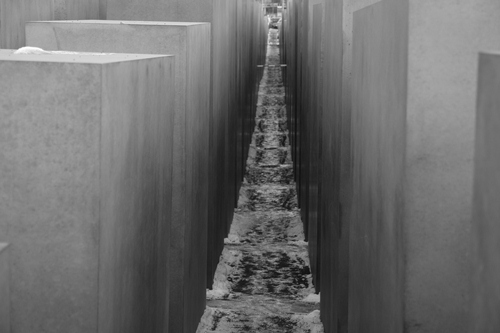 In October I spent a few days in Berlin, not for oompah and pretzels, but to check out memorial culture. I don’t know of another country that assiduously remembers the worst of its history as Germany does. Fortunately, the nation that carries the weight of Nazism did not take Ronald Reagan’s advice when he visited Bitburg cemetery in 1985 – “I don’t think we ought to focus on the past.” That could be the mantra, though, for his home state. Back in northwest California, I’m struck by how scrupulously the region forgets its sorrowful history. Throughout Germany there are close to two hundred “authentic sites of remembrance” of Hitler’s regime, as well as a lexicon of terms to describe the extraordinary variety of commemoration: memorials of apology, memorials of honor, active museums, memorial cemeteries, memorial plaques, thinking sites, learning places, documentation centers, and so on. In Berlin alone, you can spend a week going from site to site, as I did, and still not see everything. Back home in Humboldt County, a couple of hours once a year is all you need. Throughout Berlin there are memorials that catch you by surprise, blend into the everyday, and put you to work. A walk in the park can lead you to a concrete plinth with an eye-level opening that reveals a video of two men hugging and kissing, a reminder of the persecution of gays, then and now. Exiting a subway station you can find yourself face-to-face with your own image in a series of mirrors, a memorial to the Jewish garment workers who once worked in this district before they were disappeared. Walking up the impressive, red-carpeted stairway into government offices at City Hall takes you past an off-kilter, empty chair that recalls the Jewish politicians murdered by the Nazis. An evening’s entertainment at the Berlin Phil means walking by a memorial to the hundreds of thousands of disabled and mentally ill whose murder was planned close to this celebrated concert hall. Back home in California, on a bitterly cold late afternoon in February, I join a small circle of folks on the west end of Woodley Island in Eureka, Humboldt’s largest city. We are here for the annual candlelight vigil to remember ancestors of the local Wiyot tribe who were murdered on nearby Indian Island in 1860. What happened on the island was part of a coordinated rampage in several villages by some of the county’s leading landowners and businessmen, resulting in the murder of two hundred Wiyot – mostly women, children and elders, hacked to death by “quiet weapons.” Those who survived were locked up in a cattle pen at Fort Humboldt. What happened on Indian Island was not unusual. Between 1850 and 1864, some fifty-six massacres of tribal peoples took place in Humboldt County. By the turn of the century, the shock and awe of the Gold Rush, followed by settlers and the lumber industry, reduced the region’s diverse native population by at least eighty percent, comparable to the proportion of European Jews who did not survive Nazism. 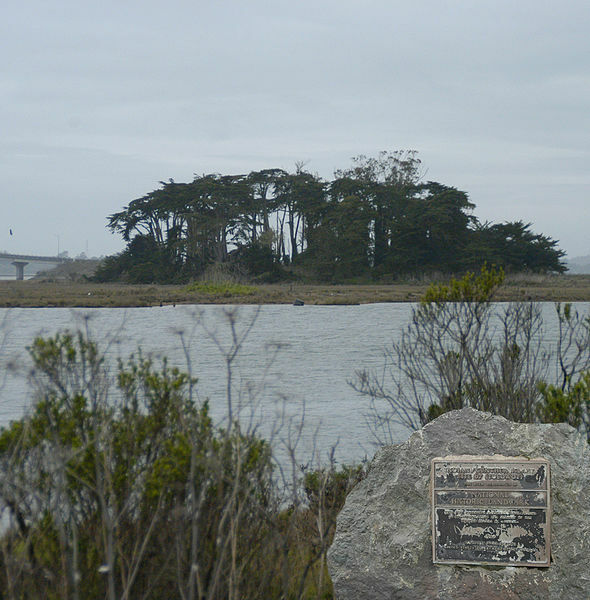 The massacre of 1860 is not the only tragedy that took place on Indian Island. Twenty-five years later, after a weeklong pogrom against Humboldt’s Asian communities, Chinese cannery workers were imprisoned in an abandoned mill on the island until their forced expulsion to San Francisco. In the early twentieth century, Indian Island became a prime spot for professional and amateur archaeologists, collectors and hobbyists. In 1913 Berkeley anthropologist Llewellyn Loud dug up twenty-four native skeletons and shipped them back to the university. Beginning in the early 1920s, a local dentist boasted that he alone excavated 382 graves. The body parts and artifacts buried with the Wiyot ended up in museums around the world, private collections, university basements, and living room cabinets. The annual circle of remembrance across the water from Indian Island is the only public acknowledgement of the region’s tragic racial past that includes genocide, ethnic cleansing, and widespread grave looting. Next to the site of our ceremony is a federal plaque, installed in 1964 to commemorate Indian Island as a National Historic Landmark. But the plaque provides no information about what happened on the island or about the victims and perpetrators. What’s missing is a connection with the people who lived here “from time immemorial” and public recognition of the bloodshed that saturates the landscape. Tony Platt is the author of ten books and 150 essays and articles dealing with issues of race, inequality, and social justice in American history. Platt taught at the University of Chicago, University of California (Berkeley), and California State University (Sacramento). In 2012, he is a Visiting Professor in Department of Justice Studies, San José State University. His publications have been translated into German, Spanish, Italian, and Japanese. His latest book – Grave Matters: Excavating California’s Buried Past – was recently published by Heyday. He lives in Berkeley and Big Lagoon, California, and serves as secretary of the Coalition to Protect Yurok Cultural Legacies at O-pyuweg (Big Lagoon). He can be contacted at amplatt27 [at] gmail.com. He blogs on history and memory at Good To Go. This entry was posted in Memory, Places on January 11, 2012 by Paul Scraton.